That’s the standard question you get when someone finds out you’re a vegetarian. In a country where most people survive on the S.A.D. – Standard American Diet – of fried meat, processed meat and lunch meat, envisioning a dinner plate without beef or pork seems an impossible task. If you tell someone you’ve eliminated the standards like hamburgers, chicken breast, and meatloaf it’s hard for them to imagine what’s left. 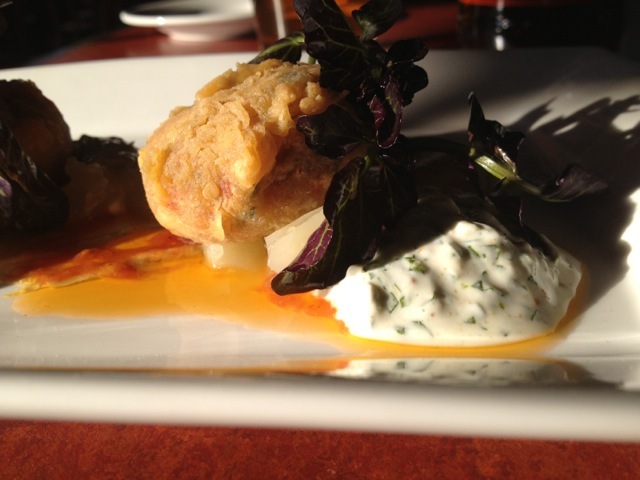 Red lentil croquettes, cashew curry, coriander-lime yogurt, fennel confit, with smoked tomato oil. 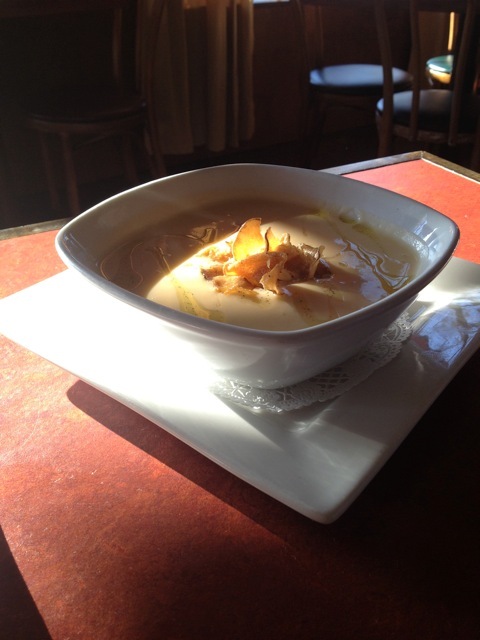 Rutabaga soup topped with crispy sunchokes and vanilla oil. 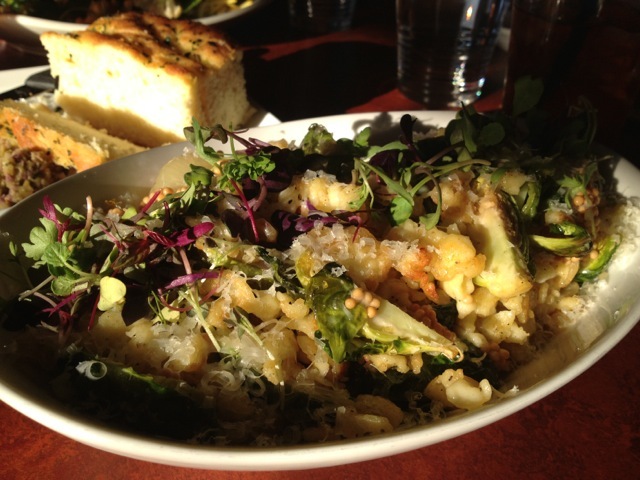 Brown butter spaetzle, nettle cream, Brussels sprouts, cippolini, aged 24 month cheddar, pickled mustard seed, and greens. 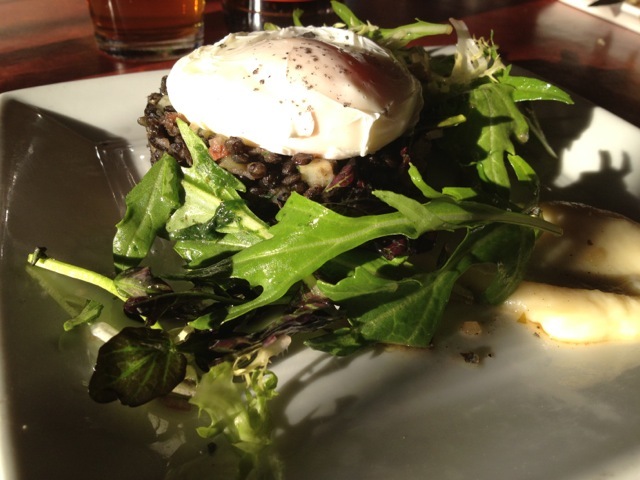 Roasted root vegetable-lentil hash, parsnip puree, poached farm egg, warm sherry vinaigrette, and Marcona. Sautéed Brussels sprouts raab, petite potatoes, caramelized cauliflower, sambal, toasted Marcona, miner’s lettuce, and pickled turnips. We finished up our meal of fiber and phytochemicals with a little fat for dessert. 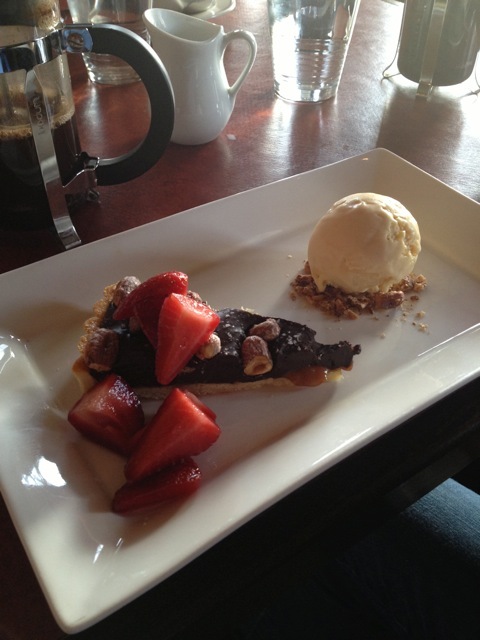 Chocolate ganache tart with caramel ice cream, strawberries, and hazelnuts. 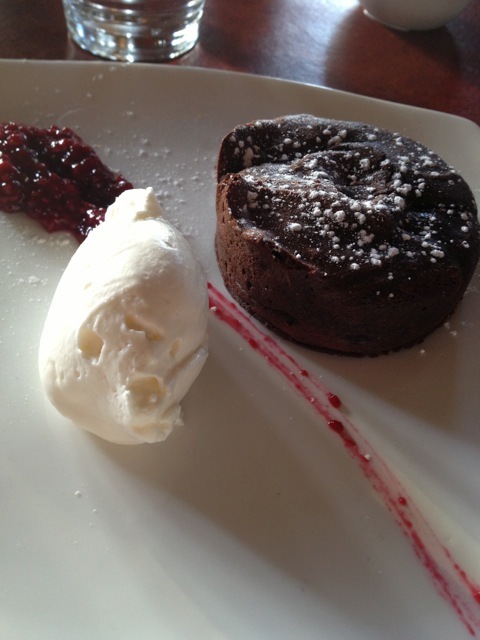 Chocolate Muck Muck: fallen chocolate cake, fruit compote, and whipped cream. You can find Carmelita in the Greenwood/Phinney Ridge neighborhood. They’re open for dinner from 5:00-10:00 pm Fridays and Saturdays, 5:00-9:00 pm all other days, but closed Mondays. 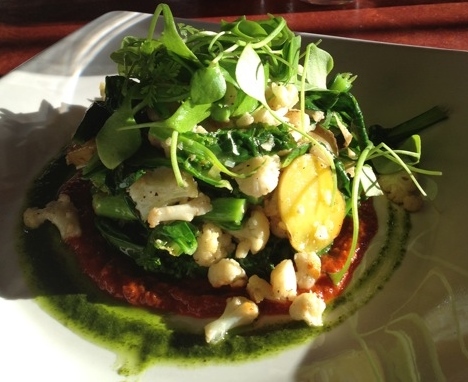 While this type of food is a bit fancy for everyday eating, the idea that the folks at Carmelita can run an entire restaurant with an ever-changing menu for almost 2 decades without ever resorting to meat should inspire the rest of us that the vegetarian possibilities are endless. How do you keep things interesting in the kitchen without using meat? Update September 29, 2013 – After 17 years in business, Carmelita has closed its doors for good. Now all we have are happy food memories and photos to remind us of this beloved Seattle institution. I’ve had my eye on Carmelita for awhile due to gushing on Twitter and the like, but this is the first time I’ve seen their dishes and heard them described. Marvelous! There it goes, up to the top of my list. Thanks for taking the time to tell us about it! Hi Jenni. I’d love to know what you think if you end up going. We really thought it was fantastic. 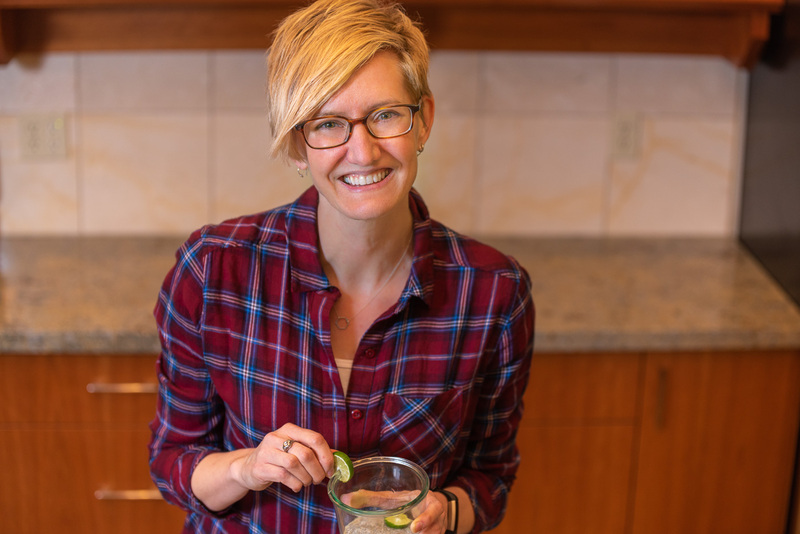 Will I be seeing you at IFBC in Seattle? Get healthier by going vegan! Hi JC. Thanks for the links to Dr. Greger’s videos. That’s very interesting. I’m familiar with the egg research, but I need to read more about the dairy + antioxidants. 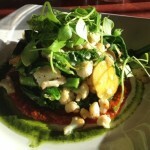 I definitely agree that a vegan diet is a healthful choice, and I eat vegan meals most of the time but not exclusively. In fact, for this meal at Carmelita, we ordered 9 menu items and 5 were vegan. You can enjoy a completely vegan meal there, which is cool. Thanks for stopping by the site.